In the last few weeks, Australia and the Arabs in the West Bank of the Jordan River have been linked in hitherto not-seen ways. Specifically, on May 10 the Murdoch owned national broadsheet, The Australian, published a piece about South Australian senator Nick Xenophon’s visit to Hebron in the West Bank of the Jordan River. Xenophon was invited by the Australian Friends of Palestine Association (in Adelaide) to tour the West Bank of the Jordan River. One of the ways that the Australian Friends of Palestine Association has promoted peace and justice in “Palestine” is through a recent boycott attempt of Israel’s internationally acclaimed Bat Sheva dance company. While I remain confident that the Australian Friends of Palestine officials will be able to muster some sort of logical explanation as to how boycotting an Israeli dance company based in Tel Aviv will promote peace in “Palestine”, I will at the same time refrain from drawing any parallels between the close connection of the Australian Friends of Palestine and the local BDS movement which also championed the boycott and which has as its published aim, the de-legitimisation of a sovereign country and its demise as the sole Jewish state. Those who are familiar with Australian politics, and South Australian politics in particular, will know that Mr Xenophon is a caring human being, with a well-developed sense of justice who made his name as the “no-pokies” Minister of Parliament. May 2104 was his first ever visit to the Middle East. To that extent, as a champion of the underdog and the under-represented, Mr Xenophon is entitled to his own opinion. However, not even Mr Xenophon is entitled to his own facts. Fortunately, Mr. Xenophon states that he is supportive of international law as it relates to Israeli settlements in an ostensibly “Palestinian” West Bank. This is as well, because under international law, all of the West Bank of the Jordan River was designated as a homeland of the Jews. In this context, then, it is unusual that a South Australian senator who is allegedly supportive of aboriginal rights for aboriginal peoples in Australia can, on the one hand stand up for indigenous peoples’ land rights as morally and legally justifiable, yet decry those same land rights when those indigenous peoples are Jews. This contextualising and understanding of those land rights, and legal codification of that understanding under international law, dates back to the San Remo Conference of 1920, that same conference which eventually led to the establishment of the generally mainly sunni Arab states of Jordan, Syria, Lebanon and Iraq [and the Jewish state of Israel]. As it was in the beginning…. At the San Remo Conference, the entire land mass between the Jordan River and the Sea, the so-called “Palestinian” West Bank, was assigned to the Jewish people. This is verifiable, and in writing, and was agreed to by the Hashemite King of the Hedjaz (later part of Saudi Arabia) who was party to the 1920 Sevres Treaty that explicitly stipulated that there would be “a national home for the Jewish people” in British Mandated Palestine. In the east, the land, not including Jersualem, Judea and Samaria, was given to the Arabs as a present to the colonising Hashemites of Saudi Arabia in return for supporting Britain and France against Turkey during the breakup of the Ottoman Caliphate. It was called Transjordan, later re-named Jordan. In the west, the land now named the “West Bank” [but legally known as Palestine prior to 1948 and designated under international law as a Jewish homeland], was given to the Jews and included Jerusalem, Judea and Samaria. And Hebron. The ancient Jewish town of Hebron, is the home and burial place of Abraham, Isaac, Jacob, Sarah, Rebecca and Leah as mentioned in the Bible and accepted by both Christians and Muslims (in that chronological order) some 1,800 years before Islam began its conquest, occupation and subjugation of the near and middle east. And while it is true that these Jewish biblical Patriarchs are also recognised by Islam as “friends of God” [in Arabic, Al-Khalil is a direct translation from the ancient Hebrew word “Haver”: friend], it is also incontrovertible that these were figures of religious importance to a Jewish nation, religion and history which had established itself and survived for one and a half millennia before even the birth of Islam. In other words, if we are to stand by that same international law which is of importance to Mr Xenophon, then Article 6 of the Mandate, charged Britain with the duty to facilitate Jewish immigration and close settlement by Jews in the territory which then included Transjordan, as called for in the Balfour declaration, that had already been adopted by the other Allied Powers. As a trustee, Britain had a fiduciary duty to act in good faith in carrying out the duties imposed by the Mandate. This was reiterated by the League of Nations, 1922, and incorporated into the UN Charter, Article 80, which prohibited the UN to tamper with the League of Nations decisions related to the matter discussed. More than that, the 1920 agreement incorporated the previous 1915 McMahon-Hussein agreement between Britain and Sherif Hussein of Mecca, where Britain separated the territory east of the Jordan River namely Transjordan (since renamed Jordan) from Palestine west of the Jordan which it had designated, under internationally codified regulations as a home for the Jewish people. And so, under international law, as the San Remo resolution has never been abrogated, it was and continues to be legally binding between the several parties who signed it. This would make the claim of an occupied “Palestine” and an “Arab-Muslim West Bank, one of the most important public-relation put-overs by those who wish to de-legitimise and demonise the State of Israel in recent times. To add insult to the injury of canvassing that Israel occupies “Palestine” as a brutal apartheid regime, it was Arab Muslims under the Hashemite king of Jordan who made a land grab in 1948 of the west bank of the land slated for a Jewish state under international law as I have iterated above. The Jordanians also illegally took east Jerusalem at the same time and annexed East Jerusalem and the West Bank in 1949 in a measured dis-regard of international law. Between 1948 and 1967, the Muslim Arabs ethnically cleansed East Jerusalem and the West Bank of Jews. This was the only time in three millennia of recorded history that Jews did not live in East Jerusalem, putting the current Arab Muslim narrative of Israeli “apartheid”, a country with 2 million voting and working Arabs, into perspective……. As many now know, East Jerusalem was taken back by Israel in 1967. Under international law, in a defensive military action. Therefore, this makes the current claim of the “Palestinians” a curious one under international law, and is a major reason there is no “Palestinian” State today on the west bank of the river: Jordan is “Palestine”. I agree with Mr Xenophon that disputes between peoples should be settled under international law. It is now time that those who would make pronouncements on “occupation” “heartbreak”, “division” and “legal right” in Israel and the Middle East, temper their comments with observation of the facts. The Muslim Arab narrative of an “occupied” “Palestine” under an apartheid Jewish regime which has “stolen” Arab land is a remarkably successful public relations coup for the Arabs. However, it will never be able to spin or circumvent international law which designated land west of the Jordan River to be the homeland of the Jewish people, and land east of the Jordan River, to be the Arab Muslim State of Palestine. To this end, Israel exists as a legal entity in a string of international understandings and treaties codified by international law going back as far as the 1915 McMahon-Hussein agreement between Britain and Sherif Hussein of Mecca regarding the division of the Ottoman Caliphate [see above]. 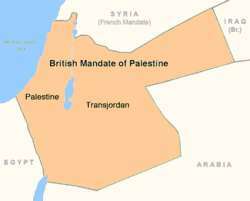 This was further reinforced by the 1916 Sykes-Picot agreement between Britain and France and supported in principle by the 1917 Balfour Declaration as a statement of intent on the creation of a Jewish state in Mandated Palestine. To that is added the legal agreements of the April 1920 San Remo Conference which entrenched under international law the principles of the Balfour Declaration. Later that same year, the August 1920 Treaty of Sèvres, abolished the Ottoman Empire and obliged Turkey to renounce all rights over Arab Asia and North Africa. Apart from the major powers, the Treaty was attended and signed by the Hashemite King of the Hedjaz as representative of Arab interests in the region who was a signatory to the explicit stipulation of the Treaty that there would be “a national home for the Jewish people” in British Mandated Palestine so long as he could lay claim to a British-supported Arab kingdom in Transjordan [in addition to the creation of the Arab states of Syria, Lebanon and Iraq…]. Even though history is said to be written by the victors, the importance and legal standing of the 1920 San Remo conference can never be wished away by those who wish for the demise of the Jewish state. If we allowed that to happen, it would open the floodgates of terror and violence. “…. the San Remo Resolution of 1920 recognized the exclusive national Jewish rights to the Land of Israel under international law, on the strength of the historical connection of the Jewish people to the territory previously known as Palestine. “Recalling that such a seminal event as the San Remo Conference of 1920 has been forgotten or ignored by the community of nations, and that the rights it conferred upon the Jewish people have been unlawfully dismissed, curtailed and denied. Mr Xenophon is an understandably busy person, with perhaps insufficient time to devote to reading all about the ins and outs of the Arab-Israeli conflict. He was invited by a special interest group to visit a part of the world he would not normally consider visiting, and he accepted. However, in the name of that same international law which he invokes so eloquently on behalf of the “Palestinians”, it behoves Mr Xenophon to pay as much attention to those legal principles which enshrine the right of the Middle East’s aboriginal/indigenous Jewish people to a state of their own before they were overrun, colonised, occupied and dispersed by waves of Muslim conquest in the 7th century C.E., some nearly two millennia after the Jews were already established in the Land of Israel. In other words, if Mr Xenophon believes land rights based on principles of continuous occupation and recorded history (but not any international law) of an indigenous people were good enough for Eddie Mabo in Australia, then those same principles (with the added legitimacy of international law) must also be good enough for the indigenous Jewish people in the State of Israel today. It is time to stop sugar-coating this four-decade campaign with euphemisms. It is time to recognise that much of the current mainstream media support of an Arab boycott of a legal Jewish entity in the Middle East is symptomatic of a resurgent anti-semitism: same canards; different actors. It is time to realise that Israel will remain implacably opposed to all those entities who would force her to build a peace on a foundation of historically refuted lies. Israel has every legal, moral and historical right to exist, because the alternative does not bear thinking about. Let us call this campaign, which hijacks the energies of myriad well-intentioned people like Mr Xenophon, by its real name: a virulent middle eastern anti-semitism of the kind the world has already seen in a different time and a different place………….. This entry was posted in Israel and tagged aboriginal land rights, Aborigines, Abraham, apartheid, aparthied, Arab-Israeli conflict, Australian Friends of Palestine, Balfour Declaration, Bat Sheva, BDS, boycott, British Mandate, Christian, de-legitimisation campaign, demonise, Foreign Minister, Hashemite Kingdom, Hebron, ICJ, international law, Jewish national home, Jews, Jordan River, Julie Bishop, Mabo, McMahon-Hussein Agreement, Mecca, Middle East, occupation, Ottoman caliphate, Palestine, settlements, Sevres Treaty, Sykes-Picot, The Australian, Tomb of the Ptriarchs, Transjordan, West Bank, Xenophon on June 9, 2014 by Alan in Australia. Nice summary. I suggest folks read Caroline Glick’s book for more details and what a single state solution could look like.